Want to make your guacamole that much better for you? This natural fermentation process allows beneficial organisms to proliferate, and causes an explosion of vitamins and enzymes. This means better digestion and support for your immune system. My family eats a a lacto-fermented food with each meal and then some — most of the time. 🙂 Given the wide array of fermented foods available, this is easy to do! Raw cheese, yogurt, milk kefir, sauerkraut, relishes and chutneys, pickled meats, water kefir, kombucha, and even probiotic ice cream… They're all delicious! Watch the video or read the print instructions below to learn how to make your own lacto-fermented guacamole! This guacamole is somewhat probiotic immediately, when you stir in the whey. So you can forego the fermenting and serve it fresh, if you’d like. Combine all ingredients together and mash well with a fork. Put in a bowl. Cover with plastic. Allow to sit at room temperature for about 7 hours. Transfer to refrigerator until serving. Skim off browned top layer if you desire a bright, green guacamole. It is fine to eat what you skimmed off. You can also mix it in, which will discolor the rest of the guacamole slightly. Enjoy! Serve with homemade (best ever) tortilla chips! How do you make your guacamole? Do you add any interesting ingredients to kick up the flavor? This post was featured in 50 Fermented Salsas, Dips, and Spreads and 92 Nourishing Grill & Barbecue Dishes, Drinks, & Desserts. Guacomole is one of my most favorite things, ever. Can not wait to try this, thanks for the video! do you know if you can you use water kefir in place of the whey? thanks. Carolina — Yes, you can. I add chopped tomatoes, a little finely chopped onion and a small amount of cilantro to my guacamole. I’m so excited to try this with the whey! We just got interested in fermented foods in the past couple weeks, and just yesterday I was wondering about fermented guacamole! Thank you! I’ve been collecting the “run-off” from our store-bought greek yogurt for about a week now, since we learned that it’s the whey and used for fermenting. It used to just go down the drain! oh yeah… And a little red onion and occasionally some chopped tomatos for a little color *pop* Thanks for the reminder, Beverly! Am I reading the recipe correctly–it IS ok to use whey from non-raw yogurt as long as it has active cultures? I’ve been doing that this whole time and I panicked for a second when you specified in the video that it had to be whey from raw cheese. I just wanted to make sure that this didn’t apply for yogurt too! Racheal — Right. The whey doesn’t have to be from raw dairy, as long as there are active cultures. Many times people think they can use any whey leftover from cheesemaking — but if the cheese was heated much past 115 degrees Fahrenheit, then the whey is no good because the beneficial organisms die. That’s why I said if the whey is from cheesemaking the cheese had better be raw — or at least not heated up. I add lime juice to keep it from discoloring. Would this interfere with the fermenting? I make homemade guacamole all the time. The key is to leave the seeds in to keep from turning brown. In addition to lime and garlic…. I dont think this would upset the fermentation. Ive made gauc in the morning and it stayed green through til the evening. This is so inspiring! Do you know if there are any things you canNOT lacto-ferment? Also, does the fermentation of avocado mean that it can last a longer period of time in the fridge? I know guacamole is something that usually gets demolished on contact, but I’m just curious… Thanks for all the great ideas! I recall Sandor Katz discussing the virtues of lettuce kvass at the same time he addresses beet kvass 😉 I’m not sure I’ll go there however! I am unable to consume any form of dairy proteins due to celiac disease. I use sauerkraut or kimchi in my guacamole instead. In fact, kimchi guacamole has become one of my favorite things! Those two things don’t sound like they should go together, but they certainly do! Monica — That actually sounds good. 🙂 Do you mix them up and let them ferment together for awhile, or mix them and eat fresh? Could you use 2 Tbl of Kombucha (live enzymes) instead of the whey? Cheryl, I am not certain about using Kombucha. It is a question I have had myself before. If you google it, you’ll find that some people do this and say it works — while others say no. Because Kombucha contains lactobacilli (the beneficial organisms responsible for lacto-fermentation)) then I say, yes, it could work. My only concern is whether the acetic acid (vinegar) prevents lacto-fermentation. I haven’t gotten to the bottom of this yet. I am certain that you can use water kefir in place of the whey though — do you have any of that? As I understand SCOBYs, the lacto bacteria will act at an earlier stage of the fermentation and the aceto bacteria will act later in the process. This is why, to begin with, your kefir will lose sweetness (lactose being metabolized by lacto bacteria) but later in the fermentation it will sour (aceto bacteria producing acetic acid). At which stage of the fermentation the different bacteria act and how it happens depends on conditions, as well as the various strains of bacteria and yeast that are in the SCOBY. I think I’ve raised more questions than answers here, but I hope that sheds a little light on the situation. My kids have a dairy sensitivity so for my cultures I use extra water kefir grains. I always have much more than I need and it’s the perfect use for them. I just play around with it, so I don’t have exact measurements. When I make a half gallon of fermented bean dip I use about one tablespoon of grains stirred into the warm beans and it ferments in 1-3 days. I hope this helps! Krista — Thank you for sharing about using the grains themselves. Awesome! You mentioned using water kefir grains for fermenting. Do you use the actual grains or the water from them? I also have a dairy sensitivity and do not want to use whey, but would like to lactoferment foods and condiments. I never thought to ferment guacamole. I’ll be trying this soon! Have you tried covering the top suface with wax paper pressed to the guac to keep it from turning brown? I know it works with regular guac and avocados. I press the wrap down to the dip and get as much air out as possible also. It’s not 100% but, MUCH better than letting the air in there. I also use fine red onion, some diced tomato and diced jalapeno in mine. Salsa if I’m in a hurry. Learned to make it that way in Colorado. And, hurray for chunky! I followed the recipe except I added juice from half a lime. There was still a bit of browning on top the next morning but it stirred in easily enough and it tasted delicious! Thanks Wardee! If I am collecting whey from store bought yogurt, how long will it last in the refrigerator? Thanks! Love this recipe and can’t wait to try it out! Lacto-fermentation is new to me, so will enjoy researching your site for more ideas! Jessica — Whey lasts in the refrigerator for many weeks. It can be frozen to last for many, many months. Enjoy! Hi there! I’ve had whey in the fridge for a few weeks and there are little white chunks in it- is it mold or milk/fat solids and how will I know? THANKS! Don’t want to pitch it if it’s still ok to use! So it does not kill the good stuff when you freeze the whey? Nope! They can withstand the freezer, but not heat. I never would have thought to ferment guacamole. I am definitely going to try this! Also, if you press the plastic right on top (touching) the guac, it does not turn brown! Thanks for another wonderful recipe. I would like to suggest that we use a plate on top of the bowls of guacamole. All plastics give off toxic vapors continuously and using a plate will not waste our precious resources. I also hope folks will consider replacing plastic storage containers with glass containers. We’ve been saving glass jars from various store-bought items (I’ve found that some things come in actual Mason jars!) and use them for everything from storage of dry goods to brewing kombucha! We have one stainless steel container we typically use for leftovers, since it is low and wide. Related to that thought, some blenders have the same thread & diameter of a standard mason jar, and you can blend small batches (single serve smoothies, sauces) right into the jar and have less mess. I just viewed your video and wanted to tell you how much I enjoyed it! The music was neat and I like how you included text in the video. Of course, I also loved the recipe. We eat avocado all the time. I like how you mashed the garlic with the mortar and pestle! I am going to see about getting one for myself! Thanks so much for the info in this video! My friend from Honduras leaves the avocado pit in the same dish. She says it keeps the guac from turning brown. Worth a try? So what I’m beginning to “get” from this whole fermented/cultured food thing is that it is healthier to eat foods that are NOT fresh but rather have decayed a bit (7 or so hours, at least). But that doesn’t make sense because MOST of the food we eat is not perfectly fresh, and in fact could be many days or even weeks old by the time we get to it. We don’t eat everything perfectly fresh but I do try to not make it any sooner than necessary in order to avoid spoilage. So what am I missing? I’d like to try cultured vegetables–even made some last summer–but ended up throwing it in the compost because I couldn’t bring myself to eat it. Anything dairy-ish would be doubly so, like the almond milk I mentioned above. What is it in my thinking that needs to change? The key with lacto-fermentation is that the right organisms are doing the work. This lacto-fermentation encompasses sourdough breads, veggies, fruits, meats, condiments, beverages, dairy… With the right environment, these organisms can proliferate and establish dominance really quickly (holding the others back). Or you can inoculate a food with an established colony of organisms to ensure a surer start. That’s what I’ve done in the guacamole by adding whey. The whey is full of lactic acid producing organisms which consume the food, giving off lactic acid and proliferating. The presence of the acid and the organisms is what keeps the bad stuff at bay. I hope that makes sense! Oh, and over time, you may adjust to the flavors. You’re not the first person to not enjoy them from the get-go. Also — your almond milk was probably spoiled. You can usually tell just by smelling. A sour smell doesn’t mean spoiled — but an offensive smell does. Eating fermented foods is so-o important for us. They are full of raw, living probiotics whih are necessary for our guts to do their job. Lactobacillius, which is in all fermented foods, is the most important and best bacteria for our gut. Also, fermented foods are important because of phytic acid. All grains, seeds, and nuts contain phytic acid. Phytic acid protects the grain from our digestion system and won’t allow the nutrients in the grain be digested by our systems. Additionally, because of the snowflake like structure of the phytic acid, when we eat grains, seeds, and nuts, the phytic acid binds to the calcium, iron, phosphorus, magnesium etc. in our bodies and carries it out of us. To combat this, all of our seeds, grains and nuts must be soaked and sprouted. Doing this greatly reduces the amount of phytic acid in the grain, but doesn’t completely get rid of it. To further unlock the phytic acid, one must eat lacto-fermented foods. The lactobacillius in the fermented foods attacks the phytic acid that is left in the grain and neutralizes it. Also, I read recently that eating fermented foods will diminish your sweet tooth. it can take away any sugar cravings that your family may have…… If you’re totally new to all of this, I highly recommend sprouting brown rice. White rice cannot be sprouted. Sprouted brown rice contains 10 times as much GABA as non sprouted brown rice and is more bio-available than in non sprouted brown rice (all sprouted grains, seeds, and nuts have an increase in nutrients over their non sprouted counterparts). GABA reduces the number of beta waves in our brain. Beta waves produce inattention, irritability, aggression, impatience, and more. Alpha waves produce a mellow, calm, meditative like state. GABA soothes the brain and tells it everything will be okay. Do you think store-bought raw almond butter could be lacto-fermented in the same way vs. making my own by overnight soaking and then pulverizing? Could this same technique be used to ferment other things? For example, because of ease and taste I buy already prepared raw almond butter. Obviously it has not been soaked and/or sprouted first. Could I use the above method so that it would be prepared properly for consumption? I’ve been enjoying this method for quite a while now thanks to you, however suddenly I have to stay away from all dairy even the tiny bit of whey. Would lemon juice alone work for this like it does for other things? Or extra salt? Liz — Doubling the salt should work — it might taste too salty though. Or you could use a pinch of a cheese starter culture. Or water kefir in the same amount as whey. Joy — I’m not sure. Can you normally freeze guac and it comes out okay? If so, go for it. LFing it shouldn’t change anything. If you google it, you’ll find that some people do this and say it works — while others say no. We just got interested in fermented foods in the past couple weeks, and just yesterday I was wondering about fermented guacamole! This is so inspiring! Wardee, would it also work to simply add a tablespoon or more of yogurt? I just got an idea while reading through the posts about preventing guac from turning brown. Exposure to air oxidizes it and turns it brown. Put the guac in a food saver container and suction the air out. Since there is no oxygen in there I think it should keep it fresh and green (may not be good for the lacto critters if they need oxygen). If you’re concerned about the food touching plastic, put it in a glazz bowl that will fit in the container. I may try this. Our family loves guacamole. We usually put tomatoes, onions and cilantro in ours, along with lime juice. I’m assuming none of those will interfere with the process? Does it change the flavor also? Debbie — You can add any of those ingredients. If you find the flavor changes from being fermented, just ferment first then add them. I often make regular (unfermented) guacamole, but I’m excited to try this. I’ve always got whey in the fridge, skimmed off the top of yoghurt & sour cream, cottage cheese, etc. I make fermented mayonnaise and ketchup also, and they last much longer than the unfermented homemade versions. Which makes me wonder, would the fermented guacamole keep any longer in the fridge than the regular stuff, which is only good for 1 or 2 days? Also, I often freeze little silicone muffin cups full of guacamole and then empty the “pucks” into a freezer bag to store. If I did that with the fermented version, would freezing kill all the beneficial enzymes & bacteria? Louise — It keeps a little bit longer, like up to a week, but not like the mayonnaise and ketchup. Does one need to use a mortar and pestle to crush the garlic or can we use a garlic press just as well? Is there a benefit to using the mortar and pestle? Also, I have a jar of home-made cabbage kimchi that I purchased. I was told to leave some of the kimchi and the juice from the bottom of the jar to make other fermented dishes just be adding to the jar with the kimchi. How would I do this? How much kimchi & juice? How do I add to it and how long and where should it be kept to ferment? I’m very new at this..
Bee — You can use a garlic press. I don’t have one and I love my mortar and pestle, so that’s why I do what I do. The general rule on saving juice is 1/4 cup per quart of the new ferment if it is chopped up mixture like kraut. Or more or less — there’s lots of flexibility. If you had lots of leftover juice, you could actually pour it to cover garlic or other cut up hard veggies, “pickling” them. Have fun. Fermenting is great! My son has a severe dairy allergy. I wonder if it would work to use a dairy-free probiotic capsule, opened up and sprinkled on the guacamole? Years ago, I used to make almond milk yogurt from fresh almonds, honey, and a probiotic dairy free yogurt starter. 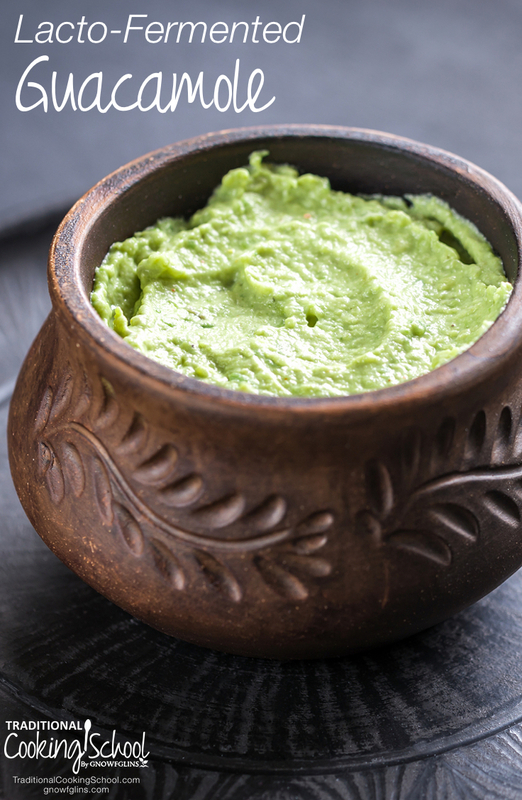 Do you know if the yogurt starter (a powder) could be used for culturing guacamole, or veggies? Would I stir the powder directly into the guac, or would I need to add a little water first? JT — Yes, that could work. I would mix the probios with a little water first, then add to the guac. Louise — It keeps a little bit longer, like up to a week, but not like the mayonnaise and ketchup. A sour smell doesn’t mean spoiled — but an offensive smell does. If I did that with the fermented version, would freezing kill all the beneficial enzymes & bacteria? Hi! I’m a semi-newbie at lacto-fermented foods, but am loving it. Your videos are very informative which I appreciate. However, I’m wondering if you can help me with a question I have. I have tried fermenting guacamole as you have done in the video, and also making pickles via the Nourishing Traditions recipe. My question is this: the only whey I currently have access too is the stuff I drain off from organic plain yogurt from the store. Will this work? It has live active cultures so I wouldn’t see why not. BUT it doesn’t seem to make stuff “bubbly” like I think it’s supposed to. My mom made pickles with her homemade whey and she said hers became slightly bubbly and basically carbonated. Mine taste absolutely delicious, by the way. Not rancid or anything. How do I know for SURE if I fermented it, or just wasted my money buying yogurt for whey?? And in Nourishing Traditions it says you can use extra salt if you don’t have access to whey. If that’s the case, then would the salt “bubble” as well?? Any wisdom or insight you have would be greatly appreciated. Thank you!!! Bethany — yes, the whey dripped off plain yogurt with active cultures will work. Yes you can use extra salt if you don’t have whey. However, NT recipes are usually too salty by double. Too much salt can also prevent bubbles because it’s too much for the ferment. Thank you for the response. So another question! If the bubbling varies so much, is there a way to know if its for SURE been fermented?? For example, my mom and I both made fermented pickles. She used homemade whey from her yogurt, and I used whey from store-bought yogurt. I also had to use cucumbers from the grocery store, whereas she used ones from her garden, which I also realize may have been an issue with mine. BUT. In the end, hers tasted really zingy (her words) 🙂 and they bubbled. Mine tasted very smooth and delicious, with no zing and no bubbles. We used the same recipe. Basically I’m just doubting that mine were fermented because they tasted SO GOOD (isn’t that bad?? Haha) I know that fermenting is not a concrete formula and that each batch varies. I’m just curious if you have any insight on how to tell for sure… I don’t want to go the effort and then in the end, it didn’t ferment anyway. Thank you so much!!! I truly appreciate your information, videos, and responses!!! My experience is that fresh from the garden produce will be more bubbly and that’s because there are more naturally present organisms on them (due to conditions)… it doesn’t mean yours haven’t fermented. If yours tasted good that is a good sign. If they didn’t ferment properly, they would have spoiled. It isn’t salty enough to prevent spoiling if the ferment doesn’t go the right way. So it’s one or the other — UNLESS you used a ton of salt in which case neither spoiling nor fermentation would likely occur. Can I use the pickling liquid from “Bubbies” pickles? The liquid has live culture. I’ve reused this liquid by adding julienned daikon and carrots and after a few months it tastes fine. How many times can I reuse this liquid? And I’ve read that no metal should come into contact with this live culture (utensils, containers, etc.). Is this true? I’m hoping to reuse the pickling liquid in the guacamole. Thanks for the recipe. I know this is long after this post, but I have a question I was wondering if somebody could help me. I love guacamole! I’ll make a batch with one avocado and eat it all by myself. I did this yesterday and ended up with bad stomach cramps and the usual with that kind of thing. 🙁 This one was ripe. I googled it and evidently you can be allergic to avocado. Now I know that it wasn’t late morning sickness, but rather the avocado in my salads several weeks ago. I had made a batch several months ago with overly ripe avocado and my stomach was slightly upset, nothing like yesterday. Evidently overly or under-ripe makes some difference according to some comments I read. So in light of this, do you think fermenting guacamole would make any difference, or would it be better just to avoid it completely? Hey, thank you for including my pumpkin seed pate in your list of fermented spreads. Twas a thrill as I’m a huge fan of yours. Re Guacamole, just tonight in fact I finely chopped a (fermented) preserved lemon in with the avocados, chopped coriander leaf, onion and salt (oh and a little fresh lemon juice). Incredibly bright/ bold flavour and amazingly green many hours later. 1. If I squirt lemon juice on the surface to delay the brown, will that damage to lacto-bacillus? 2. You said to use raw whey. But then you recommended a store bought yogurt. How raw is yogurt purchased in stores? Do I need to make my own yogurt? Thanks for the tip on the whey.